Subtitle: Cutting Edge Ministries has been teaching for 10 years that the Plan to produce Antichrist envisions a Jerusalem internationalized so all of the Monotheistic faiths can worship in peace. This covenant confirms the plan. There is also a possible '666' hidden in all these facts. This news is hot news, indeed! In NEWS1052, we report the verbatim notes I took when I was sneaked into the House of Theosophy Seminar for members only on August 18, 1991. 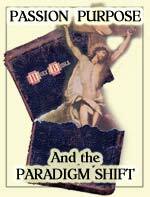 This seminar listed five concrete steps to the staging of the New Age Christ [Biblical Antichrist]. Even though we report on this issue thoroughly in NEWS1529, we want to repeat these steps here. FIVE OCCULT STEPS IN PLAN TO PRODUCE ANTICHRIST! Step 2 -- Threat of war must be maintained until all the desired changes are in place. Step 3 --Once these conferences are held simultaneously, the next desired change will be to build a combination church/mosque/temple building in Jerusalem. --- Bill further stated that "any purely political settlement in the Middle East would not, by itself, bring peace. In other words, a purely political settlement would leave the religious nature of the problem unsolved." Step 4 -- Pope visits combined Jewish/Christian/Muslim sector in Jerusalem to declare all religions are now one. This action will finally break the Middle East logjam. Note that this action will create the One World Religion called for in Revelation 13:11-18. The Second Beast of Revelation, with "two horns like a lamb" [Rev 13:11] will have arrived, and the world will consider him to be Christian, just as this prophecy states. But, we know this Beast will have the heart of a dragon -- Satan [Rev 13:11]. What does this mean, "finally break the Middle East logjam"? It means that the implementation of Steps 3 and 4, plus the creation of the Palestinian State, will be treated by nations and the Mass Media as the greatest diplomatic achievement of the modern era. Most people in the world will rejoice, because they will believe that "peace and safety" has finally been realized. Dancing will occur in the streets, parties will be held the world over, and Wall Street will soar into record highs. Think of the possibilities peace would finally bring to the earth. No more war in the Middle East. No more threats to oil supplies. No more terrorist threats. The world will enter into a false, and short-lived, peace. Do not be deceived when this peace happens. Do not go to spiritual and mental sleep, thinking that all is now well on the earth, that mankind no longer has anything about which to be concerned. Remember the warning of the Apostle Paul relative to this false peace during the time of the end. "When people are saying 'All is well and secure', and 'There is Peace and Safety', then in a moment unforeseen, destruction, ruin, and death will come upon them as suddenly as labor pains come upon a woman with child; and they shall by no means escape, for there will be no escape." [1 Thessalonians 5:3; Parallel Bible, KJV/Amplified Bible Commentary]. The "birth sorrows" of the birth of Antichrist as Jesus predicted in Matthew 24 have yet to be fulfilled: "wars, rumors of wars ... earthquakes in many places". At the right moment, all hell will literally break forth. The planned World War III of Albert Pike's demonic vision will begin. Perhaps the impetus will be the destruction of the Dome of the Rock. Perhaps Osama bin Laden will annihilate Mecca with an atomic device. Whatever the impetus will be, this destruction will be sudden, unforeseen by the masses of the people, it will thrust the world into war and will cause Jerusalem to really be the "cup of trembling" the Lord predicted in Zechariah 12. Literally, every Muslim nation on earth will declare war on Israel and begin to march against Jerusalem. The annihilation of the Palestinians foretold in Obadiah 15-18 will occur [NEWS1422]. North Korea will invade South Korea, and China will invade Taiwan, completing the World War. Riots will occur in our cities, Arab terrorists will really and truly begin to strike within our country, and chaos plus fear will reign supreme. After explaining Steps 1 through 4, Lambert held a Question & Answer session, and then took a short break. After the break, he then proceeded into the final Step 5, the supernatural appearance of The Christ. This break is highly significant because there will probably be a break in the action between Steps 4 and 5, the false peace as I described above. Step 5 -- New World Order can finally be established! Antichrist can finally arrive The Christ comes forward on to the world scene. Revelation 6:1-2 will have arrived. Out of the smoke, dust, and ashes of this World War III, Antichrist will come striding. This is the plan to specifically "solve" the Jerusalem problem between Palestinian and the Jews. The major surprise is that Arafat and the Pope signed this agreement without the participation of the Israeli government, which strongly implies that this internationalization plan will go forward with or without the Jews. No Israeli government could have visibly participated in this agreement back on February 15, 2000, for the Jewish citizenry was not in a mood to give up control of Jerusalem. Time and time again, the Israeli government, at it highest levels, has reiterated the mantra that Jerusalem is the eternal capitol of Israel and control of it must never pass out of Jewish hands. Further, Arafat's importance to the New Jerusalem Covenant Project could very well be the reason the Israeli government has been so "patient" with him, even as he directs the most murderous civilian terrorist campaign in modern history against the Jews. Arafat's terrorists have been killing Jews in Israel for the better part of a decade now, and yet, he is still in power. After each and every terrorist attack, Liberal Jews, the European Union, and the President of the United States have condemned the attacks on the one hand, while urging restraint on the part of the Israelis on the other hand. The American people would never have tolerated this kind of ongoing terrorist campaign to go on with no meaningful response from our authorities! Yet, we have demanded -- and received -- just that kind of "no meaningful response" from the Israeli government! Even when the Israeli government strikes back, it warns the Palestinian Authority hours in advance of the strike, so they can get their people out of the targeted buildings. Israeli soldiers have been told to aim at the walls and buildings above the heads of the Arab soldiers as they fire back. In this latest round, after the triple terrorist massacre that killed 33 innocent civilians and wounded over 200, Israeli missiles were fired "around" Arafat's offices. Arafat could have been taken out many times over and he should have been, but the Israelis have left him in power, so he can kill again. Since this situation makes no sense, we must seek another sense. That sense is the New Jerusalem Covenant Project and the possible timetable on which it is ticking. If a particular day had been selected to be the day when events culminate in an internationalization of Jerusalem, then we can see why it was important to the Illuminati Plan to keep Arafat alive and functioning. However, as we look back at the first paragraph of this feature article, we see that, in addition to Jerusalem being an internationalized city, Arafat is to get his Palestinian State. Now, in early 2000, this concept was a dead issue. During the entire year of 2000 and throughout most of 2001, a Palestinian State was a dead issue altogther. However, as the calendar began to tick down toward a possible date later this year or early next year, the time may have come for key Western leaders to begin talking about a Palestinian State. Thus, Prime Minster Sharon shocked his Jewish audience when he announced, in late September, 2001, that he would be willing to give the Palestinians their state, under certain conditions. Then, in early October, President Bush said essentially the same thing. Since then, both men have reiterated their support for a Palestinian State. Now, since both Bush and Sharon are suddenly supporting one plank of the covenant signed between Arafat and the Pope on 2/15/2000, are they supporting the second plank calling for the internationalization of Jerusalem? If they are supporting this plank, Sharon has a tremendous salesmanship task on his hand, to convince Orthodox Jewish leaders and the rank and file citizenry that Israel would be better off giving Arafat his Palestinian State and giving control of Jerusalem to the United Nations. While you might say, at first blush, such a scenario might never be realistic, the Jews are sick and tired of the war, and of the terrorist slaughter. They yearn to be able to go to the public park, or the Sbarros Pizza, or get on a bus, without fearing death. In fact, this civilian terror campaign has gone on so steadily for the past 10 or 11 years, one has to wonder if the average Jewish citizen might now be suffering so much trauma and mental anxiety that he just might give up Jerusalem to the international community, and he just might give the Palestinians their state -- if he can be reasonably assured such concessions will finally bring peace and safety. Now, let us examine some interesting occult numbers that seem to be underlying these events. As we have stated repeatedly, occultists worship numbers, believing them to possess inherent power. They believe that, if they do not execute a plan exactly according to the numbers, a very well thought-out plan might fail. We explain this concept in detail in CE1024, entitled, "33 33 33 = 666 New World Order Thinking". This is exactly why the occult signature of '11' undergirding the entire September 11 attacks is so important, and so meaningful. One has only to look at the calendar of the Year 2000 to realize that Arafat signed this "historical covenant" just 227 days before he started the Intifada on 9/29/2000. When you add this time period as an occultist would do, you get an '11', one of the bold Illuminist signatures [2 + 2 + 7 = 11]. For a thorough understanding of the importance of the Number '11' to the Illuminati, read NEWS1533, NEWS1538, and NEWS1541. Additionally, the start of these three simultaneous conferences was August 28, 2000, exactly 198 days after the February 15 signing of the covenant between Arafat and Pope John Paul II. When you add 198 together as an occultist would do, you get 18, a number of Antichrist [1 + 9 + 8 = 18]. Eighteen is sacred to the occultist because it it '6 + 6 + 6'. "American Intelligence chiefs fear that al-Qaeda may use a key date in the Muslim calendar as a pretext to launch new terror strikes next week. The 27th Day of Ramadan, the Muslim holy month, is the day on which the Koran was completed and given to the Prophet Muhammad ... It falls on December 12 and is believed to be one of the reasons why the White House has again issued a warning of fresh attacks." Let us reiterate the key fact in this paragraph: December 12 is a key day in the Muslim calendar because Muslims believe it was the date on which the Koran was completed and given to the Prophet Muhammad. 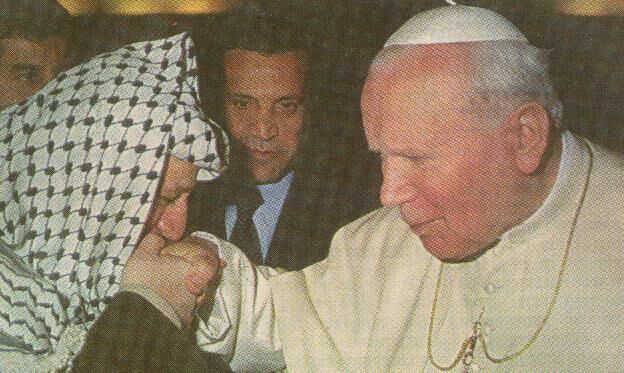 This date may be absolutely crucial when you reckon it with the covenant signed between Palestinian Arafat and Pope John Paul II on February 15, 2000. When you count the days between February 15, 2000 and December 12, 2001, you realize the time period is precisely 666 days!! Since the purpose of the Five-Step Plan as revealed by the House of Theosophy Director in August, 1991, was to produce Antichrist, we should not be too surprised if the plan actually marches according to occult numbers favorite to Antichrist. The number '666' is one of those numbers, revered by occultists because God assigns that number to Antichrist in Revelation 13:18. The number '11' and the number '13' are also key Antichrist numbers. The events associated with the attacks on the World Trade Center and the Pentagon on September 11 certainly demonstrate the key role the number '11' is having on this plan. Tom Brokaw announced on October 11 that the events of September 11 had propelled the world into the New World Order, the Kingdom of Antichrist. Key events of today are occurring according to occult numbers! We shall have to watch December 12 very carefully. Certainly, the events in Israel specifically, and in the Middle East generally, seem to be picking up momentum, to the point where some climactic event might occur on or before December 12. It is conceivable that horrific events might occur prior to December 12 that might make it reasonable to stage an announcement of a "breakthrough" agreement to internationalize Jerusalem and establish the Palestinian State on the 12th. Or, the horrific events might begin on the 12th of December, that will ultimately usher in this agreement. Remember, Cutting Edge is NOT predicting events to happen or not to happen on December 12; we are just pointing out to you that Arafat and Pope John Paul II signed a covenant on 2/15/2000 to internationalize Jerusalem and establish a Palestinian State; then this key date in the Muslim calendar -- December 12 -- is exactly 666 days after this covenant was signed. How significant is all this? Events shall soon prove them significant or just coincidental. One thing is for certain: these are End of the Age times, and mankind is hurtling toward the appearance of the occult spiritual superman, The Christ, also known as the Antichrist.